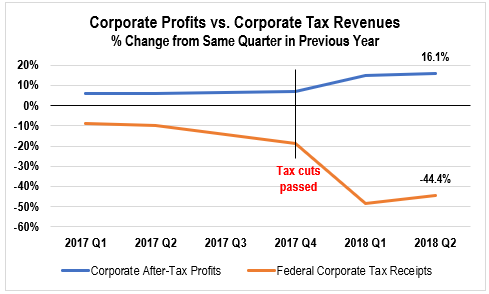 Corporate profits up, corporate tax revenues down (Figure 1): In the second quarter of 2018 (six months after the tax cuts passed in December 2017), corporate after-tax profits were 16% higher than a year earlier in the second quarter of 2017. They rose from $1.7 trillion to $2 trillion. Meanwhile, annualized federal corporate tax revenues plummeted, decreasing 44% from the second quarter of 2017, dropping from $289 billion to $160 billion. 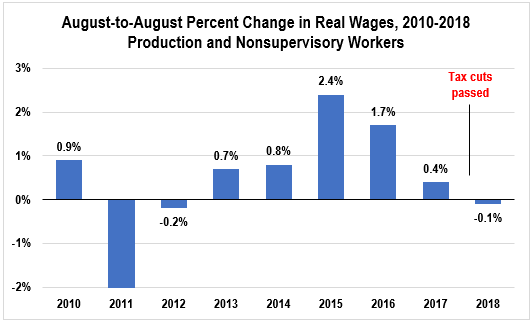 Real wage growth has stagnated after the tax cuts (Figure 2): Real (inflation-adjusted) wages decreased by 0.2% between August 2017 and August 2018. 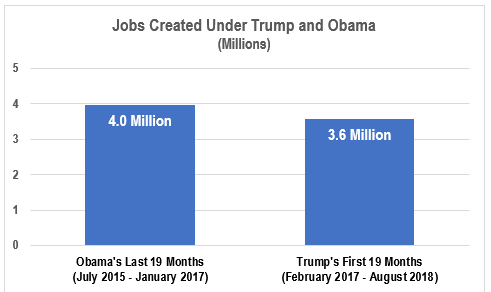 Job creation under Trump is below Obama record (Figure 3): In the 19 months since President Trump took office (through August), 3.6 million jobs have been created, well under the 4 million jobs created in President Obama’s last 19 months. 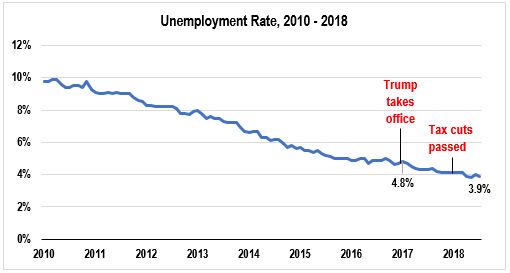 Unemployment rates were already low, don’t seem impacted by tax cuts (Figure 4): Unemployment has been on a steady downward trend since the end of the Great Recession, dropping from 9.8% in January 2010 to 4.8% when Obama left office. Under Trump it has continued the gradual decline to 3.9% at the end of August. There’s no evidence of a sharp drop in unemployment attributable to the tax cuts. 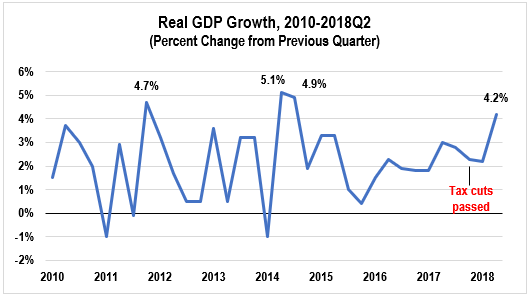 Gross domestic product (GDP) growth since tax cuts has been mixed (Figure 5): There was strong economic growth, as measured by real GDP, of 4.2% in the 2nd quarter of 2018, up from 2.2% in the first quarter. However, quarterly GDP growth is volatile—one quarter’s strong growth does not indicate an uptick in long-term growth. Moreover, real GDP growth exceeded 4% in three quarters since 2010 during the Obama years. Few employers have announced raises or one-time bonuses or new investments (Figure 7): Only 4.4% of workers (6.8 million out of 155 million) have been promised wage increases or one-time bonuses related to the tax cuts. Just 413 of 5.9 million employers have announced such worker benefits. Only 122 of 5.9 million employers have announced new investments related to the tax cuts. Corporate tax cuts are going mostly to wealthy shareholders and CEOs through stock buybacks (Figure 8): So far, 157 corporations are projected to save $80 billion in tax cuts in 2018. That’s 11 times more than the $7.1 billion corporations have promised workers through one-time bonuses and wage hikes. Since the tax cuts were passed, more than 400 corporations have announced stock buybacks of $750 billion—106 times more than what corporations have promised workers in pay hikes. Buybacks mostly benefit the wealthy, who own most corporate stock. In the second quarter of 2018 (six months after the tax cuts passed in December 2017), corporate after-tax profits were 16% higher than a year earlier in the second quarter of 2017. They rose from $1.7 trillion to $2 trillion. Meanwhile, annualized federal corporate tax revenues plummeted, decreasing 44% from the second quarter of 2017, dropping from $289 billion to $160 billion. 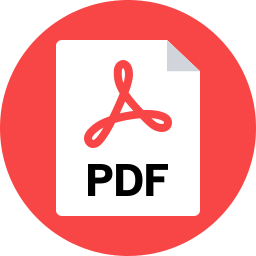 Real (inflation-adjusted) wages decreased by 0.2% between August 2017 and August 2018. This means workers actually have less buying power now than they did last year. The economy has added 3.6 million jobs since President Trump took office, well under the 4 million jobs created in President Obama’s last 19 months (through August). If the tax cuts were supposed to make businesses go on hiring sprees, that certainly doesn’t appear to have happened yet. Unemployment has been on a steady downward trend since the end of the Great Recession, dropping from 9.8% in January 2010 to 4.8% when Obama left office. Under Trump it has continued the gradual decline to 3.9% at the end of August. There’s no evidence of a sharp drop in unemployment attributable to the tax cuts. There was strong economic growth, as measured by real GDP, of 4.2% in the 2nd quarter of 2018, up from 2.2% in the first quarter. However, quarterly GDP growth is volatile—one quarter’s strong growth does not indicate an uptick in long-term growth. Moreover, real GDP growth exceeded 4% in three quarters since 2010 during the Obama years. 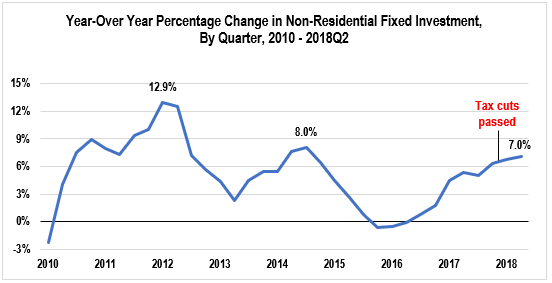 Real non-residential fixed investment increased by 6.7% and 7%, respectively, in the 1st and 2nd quarters of 2018 on a year-over-year basis. Year-over-year investment growth reached 8% in the 3rd quarter of 2014 and 12.9% in the 1st quarter of 2012. There’s no evidence of an investment boom since the tax cuts were signed into law. Even new capital goods orders (orders placed with U.S. factories for nondefense business equipment) are lower than levels reached during the Obama recovery. Americans for Tax Fairness estimates that only 4.4% of workers (6.8 million out of 155 million) have been promised wage increases or one-time bonuses related to the tax cuts. Just 413 of 5.9 million employers have announced such worker benefits. And only 122 of 5.9 million employers have announced new investments related to the tax cuts. So far, 157 corporations are projected to save $80 billion in tax cuts in 2018. That’s 11 times more than the $7.1 billion corporations have promised workers through one-time bonuses and wage hikes. Since the tax cuts were passed, more than 400 corporations have announced stock buybacks of $750 billion—106 times more than what corporations have promised workers in pay hikes. Buybacks mostly benefit the wealthy, who own most corporate stock.